There may be another way of seeing things – everyone has a perspective. Erfan reminds me of Scott Peck’s point in his book The Different Drum, how we have to move through chaos and emptiness towards community. These three stages lie beyond pseudo-community – defined by everyone getting on with each other in a superficial way. We may think that community is where we are trying to return to out of the chaos of disagreement and conflict but Peck’s point is that what we are seeking to return to is, in fact, pseudo-community. Theory U echoes this in a number of ways. Otto Scharmer writes about downloading, in which we don’t shake up our world or anybody else’s (pseudo-community). This is followed by openness to another view, but which one will win (conflict, even chaos). If we move forward, though, instead of returning to downloading, we will enter into dialogue (listening to the other, emptiness). Beyond this, there is the possibility of new imaginings and possibilities that can only emerge from generative dialogue (community or “glory” as Peck described it). – believing generative dialogue lies beyond agreeing about everything for an easy life, or one argument winning over the other, to something new being imagined and created. One of the important elements for the new-possible is to be different. What Moon discovered in her classroom repeats in just about all areas where humans come together. Friedensreich Hundertwasser named five skins we wear, and the fourth – social environment and identity – requires that we define ourselves if we are not to conform to others (the other skins are: epidermis, clothing, home and our planetary skin). 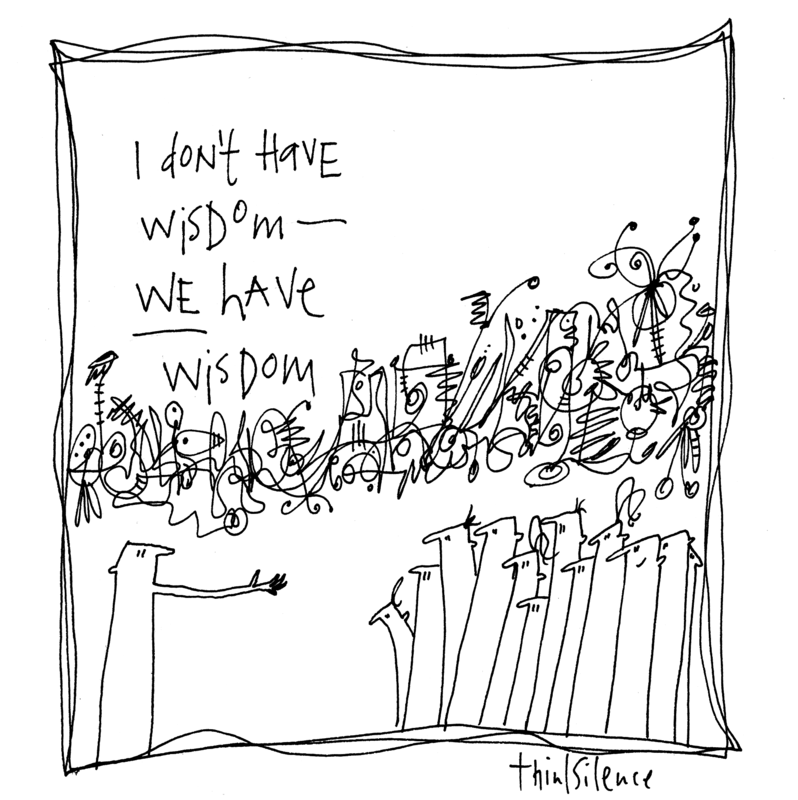 Next time we’re in a room and ready to capitulate to the person who’s speaking most confidently and eloquently, let’s remember no one alone is wise to the point of all-knowing, rather, we are wise together. Then let us share our thought, picture, feeling, song or difference.